What can you do to fight off the full range of coughs, colds and other infections when you have a house full of young children, or you commute daily with hundreds of other immune depressed commuters, or you simply come into contact with lots of people on a daily basis? If you’re anything like me, you’ll be in and out of the pharmacy for cough lozenges and medicine or constantly pandering your Doctor for a prescription of antibiotics. Now I know that antibiotics are just no good for me. In the long-term, I am doing myself no favors against more serious infections that will eventually require antibiotics. Let’s face it if my immune system has become so used to them that the tablets no longer work on me, what can I do if I become seriously ill? That’s a thought that gave me pause, and it was after a particularly nasty run of colds, flu and throat infections that I decided to think about the other changes I can make that will help to prevent myself from becoming ill. The solution I came up with was to re-arm my immune system by changing my diet. When I told my Mum about my plans she straight away suggested Echinacea because that’s her favorite remedy and my Gran used to swear by it too. Keep it in the family! And why not? Echinacea has been used for centuries to treat any number of infections. Besides coughs and colds, you can also try it on open wounds, diphtheria, blood poisoning, and other illnesses that are bacteria related. You can find Echinacea in the health shop and in the pharmacy and it’s available in capsule form. Top tip Echinacea is so effective it has even been used to rid the body of staphylococcus aureus, which causes the deadly MRSA virus. After I had expressed interest in Echinacea, my Mother then handed me a jar of Manuka honey. This stuff is great. You can apply it directly to your skin, or eat it. Applied topically to the skin it can even treat MRSA and flesh eating bacteria, and because of the organic, natural and varying nature of honey, any bacteria treated with Manuka honey will not build up a resistance. It is refreshing that honey is such a useful antidote to pharmaceutical antibiotics. Honey is super special precisely because it depends on its environment. Different bees have different access to a varying store of pollen according to the availability and the varieties of flowers grown in their general vicinity. If you can find local honey it will consist of pollen from the plants and flowers in your area and this will ensure you have a natural immunity to your local environment. Honey can be used to treat skin and eye infections simply by applying the honey directly to the problem area. Another solution to antibiotics from the store cupboard is Oregano Oil. Described by those health writers in the know as the King of natural antibiotics, Oregano Oil is extremely effective. What’s the secret? Well, the key antimicrobial ingredient in Oregano Oil is carvacrol which is thought to kill approximately 96% of all pneumococcus bacteria and 92% of all Neisseria, as well as Staphylococcus bacteria (the one that causes food poisoning). Some of these bacteria are pretty deadly. The Neisseria strain, for example, is responsible for diseases such as gonorrhea or meningitis, so Oregano Oil is truly awesome as it can attack and defeat those infections and yet it doesn’t touch the beneficial bacteria that your body needs. Other infections that Oregano Oil can be used for include strep throat, scarlet fever, rheumatic fever, toxic shock syndrome, cystitis, wound infections, and anorexia. Oil of oregano is both antiviral and antifungal so you need it in your bathroom cabinet right now. Make sure that you buy a variety that has at least 70 percent carvacrol content if you want it to be effective. One of my favorites however, is a supplement called Transfer Factors which truly provides the ultimate in immune system support. The National Institute of Health’s online service, Medline, has published over 1,200 scientific abstracts on the immune benefits of Transfer Factors. Depending on the brand name you use, Independent studies report an unprecedented 437% immune boost in Natural Killer cell activity with quality transfer factor supplements. Transfer factor messenger molecules can be found within the bodies of mammals and birds and are usually extracted from cow colostrum and chicken egg yolks. Colostrum is the first liquid that a mother produces when she gives birth. When the newborn baby mammal breastfeeds they do not get milk first off, but colostrum which contains many immune building blocks. The really good news is that transfer factors aren’t species specific therefore that means that humans can benefit from the super-resilient immune system wisdom of animals. Transfer Factors help immune cells identify threats faster and more effectively. So the next time you feel overtired, run down or feel a cold or flu coming on taking a few transfer factors any time of the day or night with or without food and you will probably avoid coming down with the cold or flu that is going around. Garlic is a natural antibiotic and antiviral agent that has been in use since time began. It has a particular history as a method for warding off plagues. Garlic contains the minerals potassium and germanium, as well as sulfur compounds that boost the immune system specifically allicin. 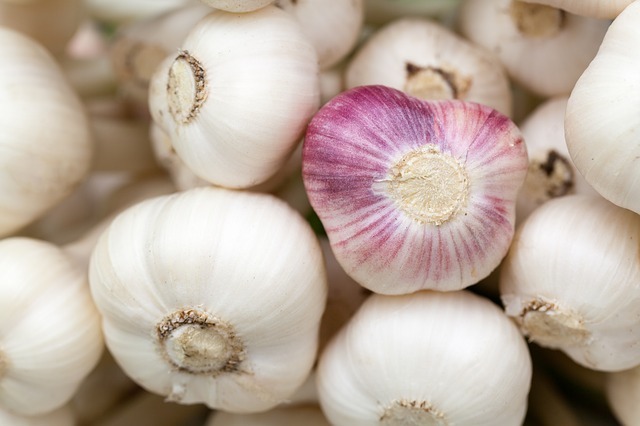 As garlic is very high in natural antioxidants it destroys any free radicals that come near the immune system. Obviously, garlic is readily available to make good use of it by adding it to your cooking. It’s great in soups, stews, with pasta and stir-fries. You can, of course, eat it raw or you can steep it in a tea. You can also consider eating more in the way of chives, onions, leeks, and shallots as many researchers think these have similar properties to garlic. Finally, consider converting to green tea. Green tea is ridiculously beneficial for health because it is weighed down with antioxidants and nutrients and of course these have a powerful effect on the body. You need a good supply of antioxidants and nutrients because they improve brain function while at the same time encouraging fat loss, and lowering the risk of cancer. One active ingredient in green tea is epigallocatechin gallate (otherwise known as EGCG), which is especially effective against some strains of oral bacteria so swish it around in your mouth to get the benefits. There are numerous other natural antibiotics for you to try, so have a look also at olive leaf extract, cloves, turmeric, lemons, and Colloidal silver and say goodbye to all those annoying coughs and sneezes that consistently grind you down. Have you read our FREE Budwig Diet guide? Or why not join our community of over 9,000 followers on Facebook and Twitter?